Rotherham will be forced into transfer activity this month as they battle the effects of a depleted squad. 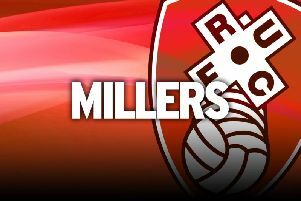 The Millers were missing seven players for their New Year's Day clash with Preston, but they made light of their struggles by posting a first win since November. Zak Vyner, Clark Robertson, Kyle Vassell and Darren Potter are all injured, Richie Towell and Billy Jones were suspended and Ryan Manning was recalled to parent club QPR on the eve of the match. Rotherham responded by recalling Jerry Yates from his loan spell at Carlisle and assistant manager Richie Barker believes they could be active in the transfer window when that was maybe not on the agenda a few weeks ago. “I wouldn't have thought that six or seven weeks ago,” he said. So light were the Millers against Preston that teenagers Akeem Hinds and Jake Southern-Cooper were named as substitutes as well as Yates but they were still one short of a full compliment. While Hinds and Yates have had first-team experience, Yates especially, it was a new experience for Southern-Cooper. It was important for the Millers, who had lost their last three games, to end the festive period on a happy note and they can prepare for Sunday's Red Letter Day at Manchester City in the FA Cup knowing they are out of the bottom three. “The winning feeling’s important. The league table, which we’ve now got to spend two weeks looking at, looks a lot better than it did before the game. The Millers have moved to tie another promising youngster down, with midfielder Ben Wiles penning a new deal until 2022. The 19-year-old has been around the first-team squad for the past 18 months and has made 11 appearances in the Championship this season. Hailing from Rawmarsh, he joined the club at under-9s level.